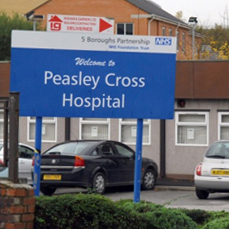 Peasley Cross Hospital is a part of the 5 Boroughs Partnership NHS Foundation Trust, a Specialist Mental Health and Learning Disabilities Trust serving the boroughs of Halton, Knowsley, St Helens, Warrington and Wigan. As part of a drive to reduce costs and carbon emissions the Estates and Facilities team decided to trial a voltage regulation system at Peasley Cross Hospital. Average voltage onsite was 246.3V and peaked at 252.8V, very close to the legal maximum of 253V. Using a voltage regulator, it was decided to reduce the voltage to 223V. This has resulted in a 17.3% reduction of electricity use and associated carbon emissions. The Peasley Cross site has been used as a hospital since 1873 and currently houses a variety of specialist units. The site operates 24/7, but has lower than typical demand due to many of the units onsite only operating during the day. The site would normally run at around 100kVA and have a maximum demand of approximately 120kVA. The over night base load was typically 60kVA. Onsite voltages averaged 246.3 and peaked at 252.8V (Phase to Neutral). Before installation, we conducted a survey of loads at the facility, listing their size, type, duty cycle and time of operation. This enabled us to understand the patterns of electricity use at the facility to accurately size the voltage control equipment. In addition, the incoming electricity supply was logged for one week to gather detailed information on the incoming electricity supply and assess aspects of power quality such as power factor and harmonics at the facility. We decided to set the initial output voltage to 223V as there are control transformers in the lifts that would need to be reset before the voltage could be reduced below this level. The switchroom was reasonably small and required the separate installation of an external bypass switch to ensure sufficient space for engineers to work. We chose the PSR-8 Regulator (specified at 161 kVA and 240 Amps per phase) as it has the capacity to control the voltage below 220V after the lift transformers have been reset. The bypass switch gives the hospital full control over their electricity supply and allows the voltage regulator to be taken off-line for inspection and maintenance if required. Additional cartridge fuses sized to the Regulator were installed to give additional protection. Preparations took two working days. Shutdown was arranged following consultation with the site occupants and completed after lunch so there was no disruption to the clients food provision. The time taken to complete the shutdown was kept to a minimum due to the nature of the preparation work. Throughout the shutdown the emergency back-up generator was used to supply the site with power. The voltage has been set at 223V, giving an incoming voltage of 220V (P-N) at the furthest point on site. 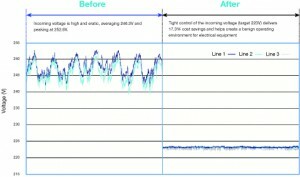 Initial measurement and verification of site energy use shows that year-on-year electricity use has been reduced by 17.3% since the installation of voltage optimisation With a steady incoming voltage, electrical equipment will operate in a more benign electrical environment, thereby reducing maintenance requirements and extending the life of electrical equipment. The voltage can be reduced to 219V when the lift motors are reset, at which point savings should increase further. Diagram 1: Illustration of the voltage profile of the electricity entering Peasley Cross Hospital before and after the voltage has been optimised.